We just bought our first home. Being a Navy family for roughly 25 years we always rented or lived in base housing, once my husband retired we found a nice rental and had just stayed there until the owner decided to move back in himself. Being lifelong renters or living in base housing relegates you to a life of “renter’s beige” walls, never being able to paint things the way you want them, only being able to personalize through furniture, curtains and limited wall hangings – although with the invention of Command hooks that has become easier. So we bought a log cabin – not something you will go hog wild with color inside either. The other day as we were staining the raw wood of the interior of our cabin, and I have gotten sick of painting the raw wood of the window frames white, repainting the garish dark brown doors a light grey to either be a base coat or their color, and painting two dressers that are going into our closet the ever slightest green tinted white – I went to our local Ace Hardware for paint for the inside of the front door. The artist in me was craving color, not only to work with, but to look at as well. That’s when I found “the blue”, Mykonos Reflection. This was a blue you can fall into it’s so deep and rich. I had to have it and I had to paint my front door this color. I came home with this paint and about halfway through the first coat, (it took two) tears started rolling down my cheeks. Tears that I think only someone who has been denied the opportunity to pick and choose the colors you want surrounding you could understand. The tears of a 54 year old, who for the first time in her life, could go to the paint store and say – “I want to paint the inside of my front door Mykonos Reflection” and actually do it, not say that and think one day I’ll be able to do that. I have other ideas and some plans for what I want done in some other areas, and trust me, more color is coming – but for that one moment it was the utmost joy to pick a color – any color – and just paint in my own home. 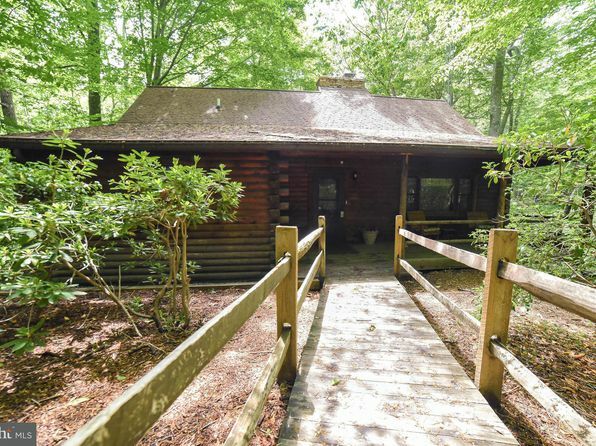 So, we started the process of buying our awesome log cabin back the first of July and the original closing date was July 31… that didn’t happen. I know everyone says closing on a new home is stressful and they have stories, but this has just been more than the usual I feel. The septic system was tested roughly the second week of July, realtor went out of the country on vacation and had someone else in the office supposedly handling her business in case anything came up. Realtor gets back in country on Wed, Thurs she reads the report from the test (and I have my suspicions that it was there prior to her leaving actually) to find out the septic system failed. We were to close that following Tues. Finally get a perc test done, we pass, and a new septic system is going to be put in, but first 3 trees have to be taken down. Nothing for 11 days. When questioned the realtor then says – I had no idea on the trees to know I had to schedule someone to remove trees before work could start on the septic system. So, she basically checked out for almost 2 weeks and we were at a standstill. Finally the trees get taken down. Now the contractor for the septic system is fighting wet areas and putting a mound system in at another location and has to finish that before working on our higher/drier location. When questioned he says, well I can drive by to see if it’s dry enough to work the location and possibly put it in while I’m waiting for the other location to dry some. Pardon me but – Duh! So now we get the new septic system in, with the distribution box now sitting about 5-6′ into what was our driveway with an access pipe sticking about 6″ above grade in the middle of the driveway and the distribution box then spans out to the drain field the other side of the driveway in the area that used to be where we were to park our vehicles – oh, and there was no driveway to speak of. Well, my husband says that’s not correct because we have the two top sections where you come in and leave, it’s just all that in between stuff that’s gone. Realtor gets another contractor out there to work the driveway when my husband contacts her to say, I really need a driveway. Contractor goes out there. Starts to work, gets pissed at what work the septic contractor left behind and stopped. Driveway contractor called the realtor to say he can’t work with what was left behind and the septic guy has got to fix things. Now the realtor knows my husband wasn’t being a pain for asking for a driveway… So sometime today (no time on this yet either) my husband, the realtor, the septic contractor, and the driveway contractor are all supposed to meet out at the cabin to figure out what the heck will be done to give us a basic circular driveway. At this point we don’t care about parking, we’ll figure that out after we’ve been in the cabin for a bit and have lived with it and know what we want then, but right now just give us a driveway that we can use, okay???!!! Supposedly this is not to hold up closing tomorrow. All parties have agreed that the work will happen/continue even after the sale of the cabin. sigh But this is the kind of crap that has just been constant and non-stop since we began this whole process of buying the cabin. I knew there would be hiccups, but this seems to be extreme! Part of the stress also comes from the fact we need to get in there and stain the inside logs before my husband heads out of country for several weeks now days after closing. (since maintenance on the logs/chinking/etc. fell to the wayside as the owner got older and she couldn’t keep up with it) With the original closing date we had a month to accomplish work and get furniture in there before he left. Now, we can get staining done, but then I’m stuck doing little stuff here and there and waiting for him to return to finish the move. I have plenty of family and friends who have offered to help with the move, but I really don’t feel like doing this by myself. I did enough of that type of thing while he was active duty Navy and I’m not wanting to let him off the hook this time. He needs to “share in the joy” with this as well. LOL It’s his home too. So, what should be a joyous, happy time has just turned into a chore to just get done and checked off a list. I feel cheated. How quickly it adds up! So that forced you to keep things streamlined while moving with the military. You always made sure you kept it below your weight allowance. It forced you to be brutal at times and not hold onto that stupid tiki drink umbrella from whatever party you went to before so-and-so got transferred to their new duty station that you had held onto to remember that night and what fun everyone had. It has been quite the whirlwind here! In a matter of days, and I mean that, as in like 3 – we drove past this beauty, called the Realtor to get a look inside, put in an offer (there had already been an offer put in by someone else the same day we put ours in), got a verbal acceptance, had the inspection and are now waiting for the VA Appraisal! Yes, my head is spinning!!!! I really fell in love with this place! We’ll be doing work on it slowly over the next couple of years to bring it out of the 80s and make it so we don’t feel like we’re living in an episode of Ponderosa or The Rifleman! 😊 But we’ll get it there eventually. It’s secluded, quiet, shaded, a very large lot for the area, and just hit all the ticket items we had. We found the unicorn. It is a log cabin so first thing off the bat is we have to go in and chink or seal all the spots where there are cracks or gaps inside and out. Then to mitigate the overwhelming, in your face wood we’re white washing/staining the walls to brighten and lighten it up in there. I know, gasp, we’re painting the wood! Do a Google search for white washed log cabin interiors and tell me that doesn’t look nice?! Thinking of actually going a soft very light tint/hint of grey or blue to the color and not stark white. We want to get that done before we start moving furniture in there. We will eventually pull up the carpet and put down flooring so we’ll cover the carpet but if we get paint on it, no big deal, it’s coming out. This will be a large focus of my creativity for the coming months I’m sure. So now I’m waiting, not so patiently, to get that Appraisal done so we can keep moving forward. I have to slam into fast forward with my packing and purging here at this house. And hopefully it all comes together at the right time! Finally back home from Florida. Crashed last night after a long stressful week. What do I do tonight??? I wake up at about 2 am and can’t get back to sleep. It’s now 4:18 am and I’m wondering if I will get any more sleep tonight or if I’m doomed to be a zombie tomorrow. Or technically today. This weekend we’ll probably be looking at a few homes, just drive bys to see if we even want to bother with going inside. Looking for curb appeal, parking situation for both vehicles and the RV, and a safe yard for the pups. Check those boxes and we can progress to the inside. I’m still working on packing up the house. I’ll be catching up on color coding the boxes here in the coming weeks. I have red for boxes that are fragile, then I need to pick up colors for the studio, bedroom, kitchen, storage, etc. Then I can put a strip on opposing corners of the box and we’ll know by sight easily where they go on moving day. Taking a break from things for a short bit while I stay with my folks awaiting some news from medical tests my Dad had. Keeping fingers crossed for good news. In the meantime we are enjoying each others’ company. I’m also taking this time to scout Zillow for listings back home and send copious listings to my poor husband to “yay or nay” or “maybe I’ll drive by to take a look see… Finding the “Goldilocks” one is nigh on impossible. But we’re giving it the good try. Before long I’ll be back to my pups, back to my art, and back to be able to help with the house search. I will be glad to get back to my routine! and getting no where fast – you know that feeling? Seems like the more I try to get things done the more pops up behind it that needs to get done or the more things get put on hold and I can’t move forward and it’s frustrating. I think the most difficult part is not having a hard date or time frame on when we are going to be out of this house. The owner wants to move back in and it was to be by the end of the year, we were shooting for fall (Sept/Oct-ish) and now that’s kind of up in the air. My goal was to just start packing up rooms, clean them up, close them off and not use them again. Then just go in and do spot cleaning when we leave to dust/clean up from non-use. We’ll see if that plan continues. I do know I will continue to downsize things and keep moving forward somehow. I swear it was easier to do a long distance move with the military than this move locally! I’m not used to long drawn out maybe we’ll do it this time, no maybe it will be this other month, no – give me a firm month please… I don’t think I’m asking for much.